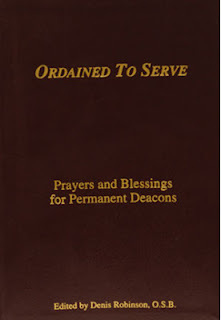 Book Review; "Ordained to Serve: Prayers and Blessings for Permanent Deacons"
Last December as I was wandering the bowels of the internet in desperation, trying to find last minute presents ideas for my personal Christmas list, when I came across a very interesting little book. I always keep my eyes open for good reading bargains so at $29.99 (Amazon price), “Ordained to Serve: Prayers and Blessings for Permanent Deacons” (By Denis Robinson O.S.B) could hardly be considered in that category. However I was intrigued by the reviews I saw on-line and against my better judgment (I have been burnt before by buying books based on the sole recommendation of online reviewers later to be sorely disappointed) I decided to “bite the bullet” and make the investment. Imagine my surprise when I received it in the mail and discovered that I had been looking for this book since my ordination day! You see one of my complaints about books geared specifically towards clergy is that although there is much out there for protestant pastors and Catholic priests, when it comes to the Latin rite diaconate your options are very limited; mostly books about the history of the deaconate or the theology behind this state of clerical life. However when it comes to books about the spirituality of deacons the selections drop almost completely to zero. So I was pleasantly surprised about the amount of prayers and reflections geared at helping the deacon in their spiritual and prayer life. Now, do not misunderstand me; this book is NOT a 100% book about the spirituality of permanent deacons. 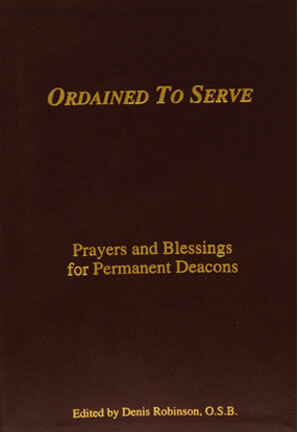 In it you will find a variety of practical blessings for the deacon to use in their ministries. For example you will find blessings for things like pixes, houses, furniture and kitchens; prayers for before cooking, cleaning, and before sitting down to study. It has blessings for before the pastoral council meetings, blessings for deaconate candidates, mother’s and father’s day blessings, blessings for expectant parents, and blessings for bringing home a new child. They are many more of these practical blessings in this book. I should also say that all these blessings follow the same pattern of: introductory greeting, scripture reading, prayer and benediction. So, each rite should take 5 to 10 minutes. In addition of the many blessings in this little book, and the reason why I think of it as a permanent deacons spirituality book also, you will also find deacon meditation aids, which will greatly enhance your prayers and spiritual life. In this book you will find a novena for deacon candidates and for those to be ordained, blessing for those leaving the formation program, Prayers to St Joseph for the sanctification of the deacon’s work, prayers for the preparation of homilies. It includes a large section with prayers to be used during personal holy hour. It also has the Deacon’s Stations of the Cross meditations, examination of conscience for deacons, deacon’s prayers and meditations for Advent, Christmas, Lent and Easter, and personal meditations for before mass and before baptism, and much, much more. In its 327 pages, there is a prayer or a meditation for almost every aspect of the diaconal ministry as well as enhancing the deacon’s prayer and spiritual life. To me the most moving and poignant prayers and blessings are in the section “The Death of a Deacon and General Prayers”, which includes prayers and blessings for a dying deacon, and rite for vesting a deacon after his death, a reminder that our ministry is not just something we do, but something we are for all eternity, and that the dignity of a deacon remains even after the Good Lord has called us into his presence. If I were to lay a criticism on this book it would be this: although it contains a great deal of prayers, blessings and meditations that would greatly enhance life of a deacon, the way these are organized is not the best. In fact the book has no index, it just presents a “Table of Contents”, which is only a list of the 13 sections into which the book is divided. These will give you a general idea of where things are, although I have found myself looking for a specific prayer in the wrong section many times. Luckily the book comes with tree ribbons to mark pages, but these are not enough for the treasury of spiritual writings this little book possesses. In conclusion I would highly recommend this book for deacons that are looking to enhance their spiritual life as well as complementing their day to day ministry with ready-made prayers and blessings. I would place it in order of importance within my ministerial bookshelf, right next to my “Book of Blessings” and my “Pastoral care of the Sick”. I should add that after buying this book for myself and using it I liked it so much, I purchased another and gave it as a gift to a friend and I’m planning to give one to a soon to be ordained deacon.